Be ready to be astounded by a one-woman 75-minute one-act play where local actress Jennifer Mays plays 40 (yes, 40) different characters in rapid=fire switches from one to the next without so much a catching her breath between character voices and body language in The Unicorn’s latest production, “Application Pending” that opened Dec.10. In “Application Pending” Jennifer Mays plays Christine Evans, a kindergarten assistant who is promoted from classroom to the head of kindergarten admissions with no notice. The show opens with her arriving for her first day on the job after her predecessor has moved on to pursue other options. Accordin to a Unicorn press release, Mays plays over forty wild characters in this side-splitting tour de force. “Jen Mays is doing one of the hardest things that any actor has to do…holding an entire show together all by herself in the most clever and skilled way. 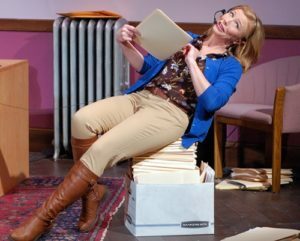 I saw “Application Pending” yesterday, and her talent and wit makes you want to stand up and applaud her about a dozen times through the 85 minutes,” Darren Sextro, local director, said. Sextro is right. The performance is extraordinary. Mays gives a tour-de-force performance from the moment she steps into the office through her curtain call. She gives an exhausting performance that leaves the audience gasping for air. She’s in constant motion and shifting characters with precision. Her professionalism in approaching this part gave Cynthia Levin pause. Levin said that Mays came to the first rehearsal already prepared, fully memorized, and off book. The preparation paid off for the audience. Give credit to director Ian R. Crawford and the entire production team. They all did a good job of making this show tight, focused, and moving. The sound, the lights, the props, all helped make this a one of a kind evening. The behind the scenes professionals make a show sink or swim. This one is like an Olympic relay race. 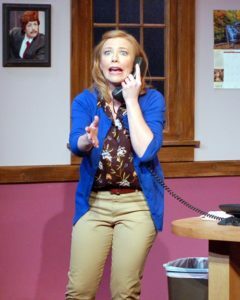 ”Application Pending is on Unicorn Theatre’s Jerome Stage located at 3828 Main Street, Kasas City, MO64111. The show runs Dec 7 – 26. Playwright Andy Sandberg will share his insights into the show at a Featured Friday talkback after the performance on Dec. 16 with free coffee and dessert. Performances run Tuesday, Wednesday and Thursday at 8 p.m., Friday and Saturday at 8:30 p.m., and Sunday at 3:30 p.m.
Any person unable to afford a ticket, may Pay What U Can at performances on Tuesdays, Wednesdays and Thursdays, because The Unicorn believes art is for everyone. The week of Christmas, there will be a Monday performance on Dec. 19 at 8 p.m. There will be no performances on Dec. 24 and 25. The closing performance will be on Monday, Dec. 26 at 8 p.m. Tickets are now on sale. Call 816-531-PLAY (7529) EXT. 10, go online at the Unicorn website, or buy in person at the box office located at 3828 Main St., Kansas City, MO 64111. Special discounts are available for seniors (65+), students, and patrons under age 30.